The "Exchange" or "Customs House" was built to accommodate the expanding needs of the vast trading and shipping business that flourished in the City of Charles Town. The merchants and investors of the Charles Town's elite petitioned the South Carolina colony's Royal Assembly in 1767 to pass an act for an "Exchange" or "Customs House" to be built similar to ones in London and Bristol, England. The architect was William Rigby Naylor, and the construction of the "Exchange" was awarded to Peter & John Adam Horlbeck, master masons from Saxony. The construction lasted from 1767-1771. One of the notable features is a columned, octagonal cupola with Venetian windows and a dome capped center of the roof. The citizens of Charles Town met here to protest the British Tea Tax on December 3, 1773. This was the first meeting of the SC General Assembly, and the birth of the present SC state government. The first shipment of taxed tea was seized by the local authorities, stored in the Exchange, and sold to help finance the patriot cause. The second cargo of tea arrived on November 3, 1774, and the local merchants emptied the tea into the Cooper River; this was the City of Charleston's "Tea Party". South Carolina declared independence from Great Britain from the steps of the Exchange on March 28, 1776. The local SC Patriots, led by Gen. William Moultrie, walled up 10,000 lbs. gunpowder in a secret chamber created by bricking in a false exterior wall. This was never discovered by the British during its occupation 1780-1782. 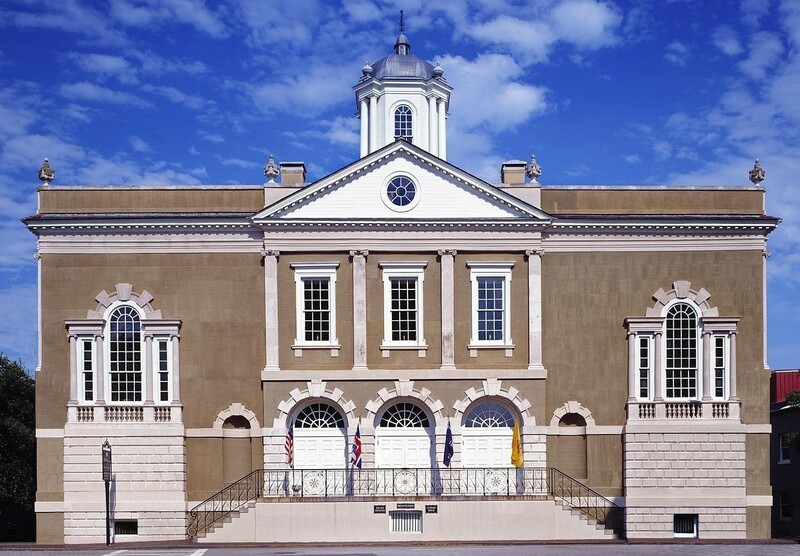 The British Army also used the dungeon of the Exchange Building to confine military & political prisoners; notably, Arthur Middleton, Edward Rutledge, and Thomas Heyward, Jr. (signers of the Declaration of Independence), Lt. Governor Christopher Gadsden, and Col. Isaac Hayne (a prominent American to be executed at the Old Exchange during the American Revolution for treason against the British Crown). The Exchange was conveyed to the City of Charleston in 1783, and was used by the SC General Assembly in 1788 when their meeting place was destroyed. South Carolina's Constitutional Convention was held in the "Great Hall" of the Exchange Building, and on May 23, 1788 South Carolina became the eighth state to ratify the United States Constitution. President George Washington visited the city of Charleston for a week in 1791. A ball was held in the president's honor in the "Great Hall" of the Exchange Building. The "Exchange" Building was conveyed to the Federal government in 1818 by the City of Charleston. It became the Post Office, and continued to be used as the Post Office and Federal office until 1896 when it was vacated. The building had been damaged by an earthquake in 1886. The US government decided to sell the building, but in 1898 it was turned over to the U.S. Light House Department (Coast Guard) for its use. In 1898, the Rebecca Motte Chapter DAR Regent, Mrs. Francis Mather Jones appointed Mrs. Lee Cohen Harby, as chairman of the committee, "to secure the Exchange as a gift from the United States Government to be held by the Chapter as an historical memorial". 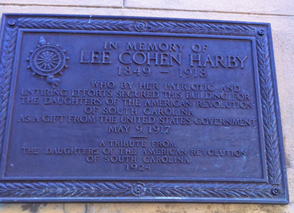 "to convey, by quitclaim deed, the building formerly used for post-office purposes and now known as the "Old Exchange," in the city of Charleston, South Carolina, to the order of Daughters of the American Revolution in and of the State of South Carolina, to be held by it as a historical memorial in trust for such use, care and occupation thereof by the Rebecca Motte Chapter of said order, resident in the city of Charleston, State aforesaid, as the said chapter shall in its judgment deem to best sub serve the preservation of said Colonial building and promote the honorable and patriotic purpose for which the grant is requested". The ladies of the Rebecca Motte Chapter began to preserve and renovate the Old Exchange Building. By 1975 it was apparent that the Old Exchange Building was in need of major repairs and renovation. The Rebecca Motte Chapter led by its chapter regent, Armine Richardson lobbied the State Bicentennial Commission to make the Old Exchange Building its Project. With help from SC Governor, James B. Edwards, the SC General Assembly passed an act creating the Old Exchange Commission on October 25, 1975. The Old Exchange Commission, a state agency was given operational and administrative control of all matters relating to the Old Exchange Building. The nine members of the Old Exchange Building consist of the following: 3 members must be elected by the House of Representatives and Senate in joint assembly; two members must be elected by the Rebecca Motte Chapter of the Daughters of the American Revolution; two members, who must not be residents of Charleston County, must be elected by the South Carolina Society of the Daughters of the American Revolution; and the director of the Department of Parks, Recreation and Tourism and the chairman of the Department of Archives and History or their respective designees serve ex officio with voting privileges. 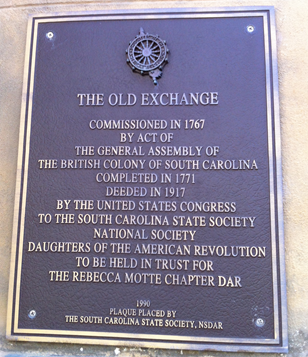 The South Carolina State Society, NSDAR and the Rebecca Motte Chapter, NSDAR continue to govern the Old Exchange Building by their seats on the Old Exchange Commission. The Old Exchange Building was leased by the South Carolina State Society, NSDAR and the Rebecca Motte Chapter, NSDAR to the Old Exchange Commission for 25 years beginning on December 16, 1976, and subsequently renewed since then. Beginning in 1999, the Old Exchange Commission reached an agreement with the City of Charleston to manage the daily operations of the Old Exchange Building. The city does an excellent job of giving tours to the public, educational programs, and events. The Rebecca Motte Chapter has made the Old Exchange Building its headquarters since 1921. They moved out during World War II, and resumed its occupancy at the end of the war. The Rebecca Motte chapter has a special chapter room where it holds its meetings, displays its antique and artifact collection to the public, and houses it archives with documents dating back to the chapter's founding in 1895. The South Carolina State Society also uses the Old Exchange Building for special events and meetings. Monday, April 15, 2019, Meeting at 11:00 a.m. in the Great Hall of the Old Exchange Building with chapter member Anna Hilton discussing Women’s Issues followed by a potluck luncheon. The Chapter is providing a honey-baked ham, biscuits, sweet tea, water and lemonade.